In the last post, I showed how I split the MIDI rock drum kit used in my track “Intermission” over multiple channels for increased control at mixdown (you can hear the completed mix above). In this installment, I’ll talk about the processing used on the individual drum sounds. And in case you didn’t grab it in my last post, you can download the entire “Intermission” Mixcraft 6 project below (as mentioned before, certain plug-ins may be disabled depending upon which edition of Mixcraft you’re using). Kick drum: Kjaerhus Audio Classic Compressor (man that’s hard to spell!) 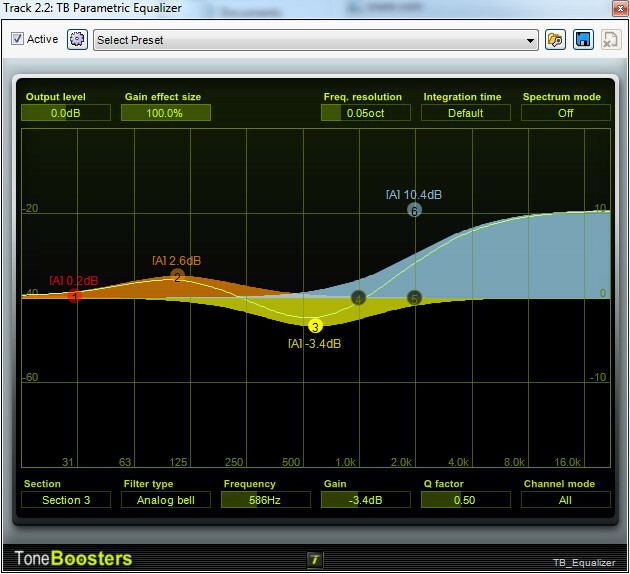 and TB Parametric EQ channel insert effects. The goal of drum compression is to squash the signal for more thickness and decay without flattening the impact of the attack. Fist dial back the threshold control until the gain reduction light flashes intermittently- enough so you can hear the compressor’s effect, but not enough to completely squash the snare. Next, increase the attack knob enough to allow the initial transient through. Remember that the attack and release knobs effectively work backwards- they’re adjusting the curve of the compressor’s actions, not the actual sound. A longer attack means the compressor takes longer before it compresses, hence letting more of the sound’s attack come through. I know, it’s a little confusing! Keeping in mind our “backwards” settings, I set the release at zero for maximum decay. I strongly recommend experimenting with the threshold, attack, and release controls to better understand their actions. 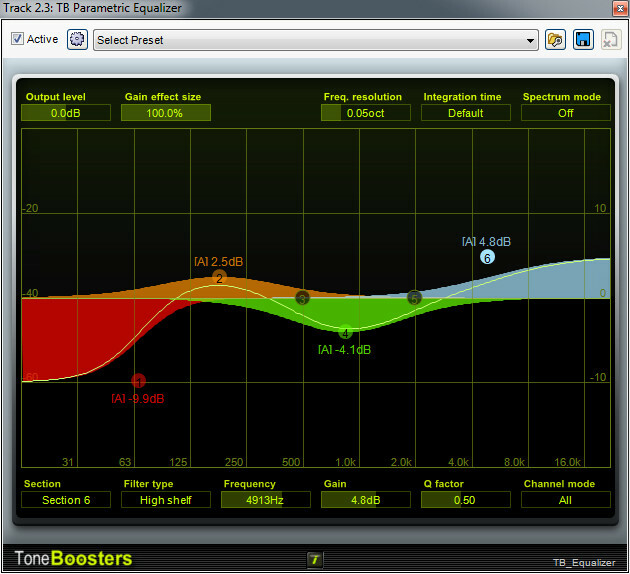 Following the compressor is a TB Parametric EQ. I boosted at 100 Hz for low-end muscle, dipped around 400 kHz to reduce boxiness, and gave a slight boost around 1000 Hz for more beater attack. Settings can vary depending on the kick and personal preference, but these are relatively universal for acoustic kicks. Snare drum: Same insert effects here- Kjaerhus Audio Classic Compressor followed by TB Parametric EQ. I also created a send channel with a Kjaerhus Classic Reverb. Most people prefer send tracks for reverb because this lets you send varying amounts of different channels to the same reverb instance. This was more important when computer DSP power was limited (or when studios had a limited number of hardware reverb processors), but it still makes sense to keep multiple tracks in the same virtual acoustic space. You’ll notice my settings for the compressor are similar to the kick drum because we’re trying to accomplish the same thing- thicker body and more decay while retaining the smack of the stick hit. Moving over to the EQ, again I’ve punched up around 100 Hz (I may have listened to too many Van Halen records as a kid), dipped around 600 Hz, and used a high-shelf for a pretty dramatic lift beginning around 2 kHz. Keep in mind that the ringy “pang!” of snare drums lives right around 600 Hz- personally I hate it, so I’m always trying to kill it (and choose snare samples that don’t have much of it), but The Red Hot Chili Peppers and 311 made careers out of that sound, so if you love it, feel free to boost it to your hacky-sack kickin’ heart’s content. As for the dramatic high-shelf boost… I usually start with just a little bit, but as mixes grow, the high end smack of the snare can get buried. My advice is to start with a little boost, and push the high end as necessary depending on the rest of the mix. Always listen in context because it’s the entire mix that matters (I almost sound like I know what I’m doing, right?). To create a send channel for the reverb, select Track>Insert Track>Send Track in the Track menu at the top, then insert the Kjaerhus Classic Reverb (or whatever reverb you choose) into the channel by clicking on the FX button (you can do this from the channel in the arrange window or in the mixer window). Once the reverb is inserted, you can adjust the send level with the red knob at the top of the mixer window- in this case I set it to 100. If you’re using multiple send tracks, make sure you’ve selected the correct Send Channel in the pop-up menu at the top left in the mixer. 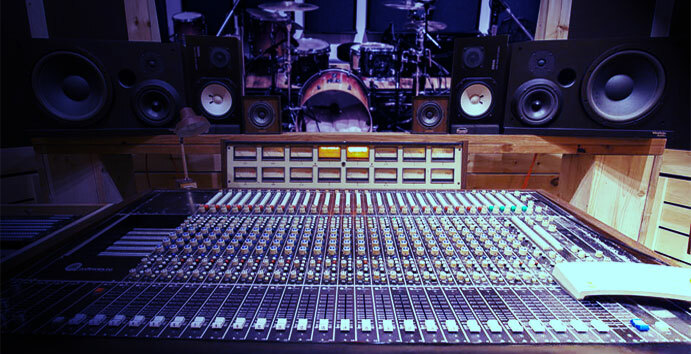 I set the reverb to a medium large space- the size knob is set to 160m squared (25,600 sq meters for those keeping track. I think that’s the size of 370 European gymnasiums, but don’t quote me on it). Actually, to my ears it sounds like about a second of decay. I have the damping control on zero, which equals a relatively bright, vintage-plate sound. Also notice that the mix knob is set to 100% effect. This is very important when bussing to a send channel – if there’s any direct signal, you’ll get direct signal on the instrument’s mix channel AND the effect send channel. This can make setting the basic dry signal level really confusing (and this only gets worse if you send multiple instrument sends to the same effect). Always set send channel bus effects to 100% wet, that way the fader is only mixing in effected signal. Toms: Again, I’m using a Kjaerhus Audio Classic Compressor followed by TB Parametric EQ. And again, my compression settings are almost identical to the snare. These can be tweaked depending on how cannon-like you prefer your toms- super booming toms may not be appropriate if you’re doing modern country rock, but oddly, pounding drums have sort of become the norm across a lot of music genres. Turning the threshold knob toward zero or the release knob up will mellow them out. In the EQ, I removed low-end mud from the toms with a low shelf set to a corner frequency of 67 Hz, though you can see its effect is heard much higher in the spectrum. I boosted around 180 Hz where some of the power lives, cut around 850 Hz to reduce boxiness, and finally added a high shelf around 4900 Hz to increase definition. A lot of this is trial-and-error, and unless you have specifically obnoxious frequency ringing, the specific frequency settings aren’t all that critical. Think of it more like molding large chunks of clay into basic shapes. Finally, I set the tom channel’s reverb send to 74- not as much as the snare, but a fair amount of ‘verb action. High hats: I usually keep these on a separate channel from the other cymbals for two reasons: 1) it simplifies panning, and 2) I often use automation to briefly boost the volume of cymbal crashes, so this way I don’t “interfere” with the hat volume. I usually don’t do much in the way of processing- here I simply cut some lows and boosted some highs with Mixcraft’s channel EQ. I also “bled” the hats into reverb send channel a little bit with the send knob at 40. This helps to glue everything together- remember that with a real mic’d drum kit, the drums bleed into adjacent mics all over the place. Cymbals: This should really just say “cymbal” because I only used one crash cymbal, and there are no ride cymbals in this song. I don’t usually compress cymbals, but this one wasn’t sounding splashy enough, so I used another instance of the Kjaerhus Classic compressor, again with similar settings- slowish attack, fast release. 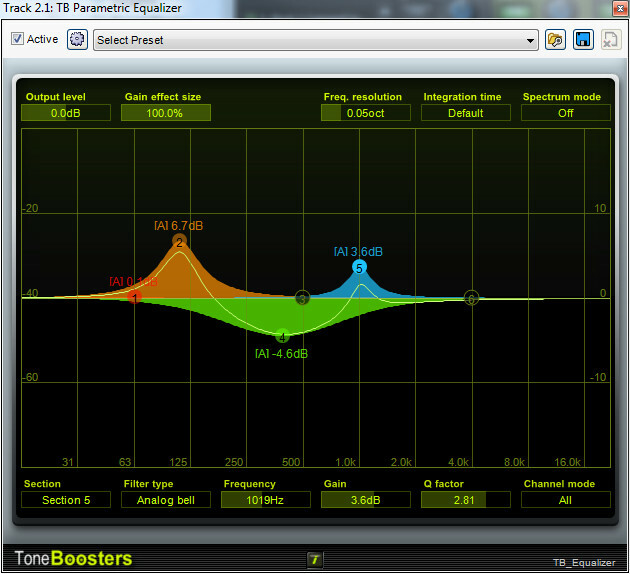 I also boosted the highs with the channel EQ and set the reverb send to 100. Finally, I grouped the drums together by creating a SubMix track (select Track>Insert Track>SubMix Track in Track menu at the top). This simplifies things visually in the arrange window, and lets you control the volume of the entire drum kit with one mixer fader. Next installment we’ll go over recording bass and electric guitar, aka things-with-strings!